The Wild Turkey has a large global range reaching up to generally 4 million square kilometers. This bird can be found in Canada, Mexico and the United States. It also has vagrant populations in Australia and New Zealand as well. 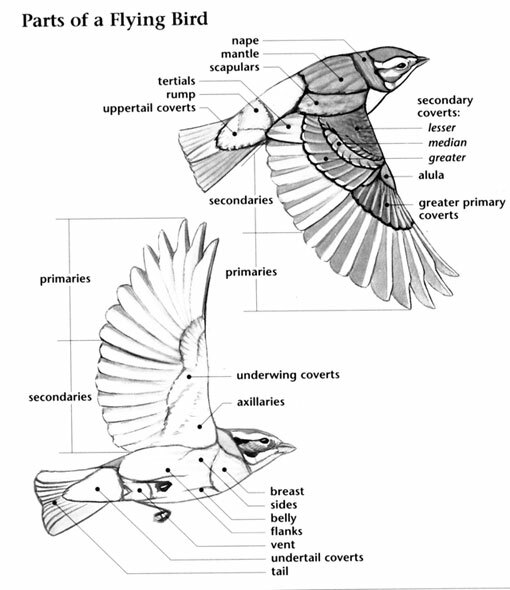 This bird dwells in a diversity of environments including forests, savanna, shrubland, grassland and pasturelands. The global population of this bird is estimated to be around 1.3 million individual birds. Currently, it is not believed that the population trends for this species will soon approach the minimum levels that could suggest a potential decline in population. Due to this, population trends for the Wild Turkey have a present evaluation level of Least Concern. Wild Turkey: This large, ground-walking bird is iridescent dark brown overall with black and green bars and a small, featherless blue head that changes color with mood. Red throat wattles, black breast beard and legs with spurs. Female is smaller, duller, and lacks spurs and beard. Diet includes insects and grains. Swift powerful flight for short distances with rapid wing beats and deep strokes. Wild Turkey: Resident throughout much of the United States and extreme southern Canada extending south to inland Mexico. Introduced to many western states, including California and the Pacific Northwest. 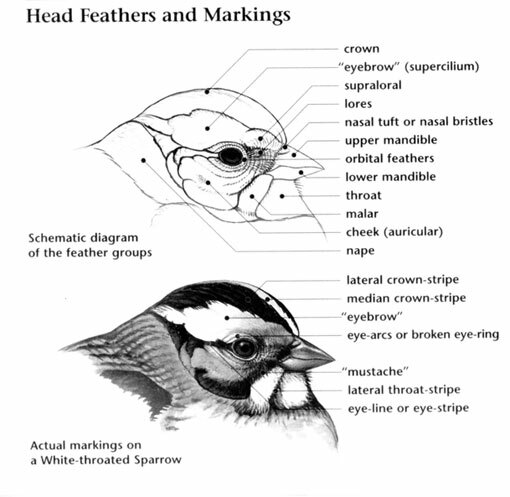 Inhabits oak and pine forests; young birds need open areas, which allow them to forage for insects. High-pitched calls from a group of young chicks. Calls from a small group of females. The Wild Turkey is one of only two domesticated birds originating in the New World. The other is the Muscovy Duck. European explorers took them to Europe from Mexico in the early 1500s'. They were so successfully domesticated there that English colonists brought them back with them when they settled on the Atlantic Coast. The idea that Benjamin Franklin preferred the Turkey as the national bird of the United States comes from a letter he wrote to his daughter in 1784. He criticized the choice of the Eagle as the national bird and suggested that a Turkey would have made a better alternative. A group of turkeys has many collective nouns, including a "crop", "dole", "gang", "posse", and "raffle" of turkeys. The range and numbers of Wild Turkeys had decreased in the early 1900s' due to hunting and loss of habitat. Game managers believe their numbers were as low as 30,000. Current estimates place their population at over 7 million. An order of five families found on most continents (some taxonomic systems only recognize four of these, classifying the fifth as a sub-family), the GALLIFORMES (pronounced gal-lih-FOR-meez) include “fowl” like birds such as guineafowl, pheasants, grouse and turkeys, and the wild ancestor to the domestic chicken. Partridges, Grouse, Turkeys and Old World Quail are members of the Phasianidae (pronounced fah-see-AH-nih-dee), a family of one hundred and eighty-seven species in fifty-six genera found on all continents except for South America and Antarctica. In North America, the Phasianidae is represented by twenty-six species in seventeen genera. This total includes several introduced and native species such as the Wild Turkey, prairie chickens, and various species of grouse. The Phasianidae are known for their elaborate courtship displays that frequently utilize raised tails that are spread to reveal intricate patterns. Male Sage Grouse, Sharp-tailed Grouse, and prairie chickens take these displays a step further by displaying communally at traditional “lekking “ sites where birds inflate prominent neck and chest patches that produce loud, popping sounds. The Phasianidae range in size from the small Japanese Quail to one of North America’s largest bird species; the Wild Turkey. Regardless of size, all members of this family have stout bills, long, strong legs and short wings that attest to a mostly terrestrial lifestyle. Several species also have fairly long tails that are adaptations for their courtship displays. Aside from the radiant, iridescent plumages of male Indian Peafowls and some pheasant species, most of the Phasianidae exhibit barred and streaked patterns in tones of brown and black that match their terrestrial habitats, thus providing these birds with excellent camouflage. In winter, the ptarmigans molt from such brown and gray dominated plumages into mostly white plumages to match their snowy environments. Bright colors in native North American species are restricted to bits of red, orange, and purple found on the necks and heads of some members for display purposes. In North America, the members of the Phasianidae occur in tundra, grasslands, and forest. Three species of ptarmigan crouch in the far northern tundra and alpine habitats of the Rocky Mountains while the sage-grouse, Sharp-tailed Grouse, and prairie chickens display in sagebrush and grasslands of the west. Deciduous and coniferous forests are home to the Wild Turkey and four grouse species. Introduced species live in a variety of Hawaiian habitats while the Ring-necked Pheasant is now common in North American grasslands. Aside from occasional short-distance migration by the ptarmigans of the far north, species in the Phasianidae spend all four seasons in the vicinity of their breeding grounds. Partridges, Grouse, Turkeys and Old World Quail often flock together to forage for small creatures, seeds, and buds. Most look for food on the ground although the Spruce Grouse also forages in the trees for pine and spruce needles. Although populations of Wild Turkeys have made a wonderful, successful comeback since their decline earlier in the twentieth century, all five species of grouse that occur in sagebrush and grasslands (sage-grouse, Sharp-tailed Grouse and prairie chickens) have threatened and declining populations. These declines are due to degradation and conversion of their grassland habitats to agriculture and other development. To aid in walking in their snowy winter environments, Ruffed Grouse and ptarmigans have evolved “natural snowshoes”. In Ruffed Grouse, scales on their toes have extensions to keep them from sinking into snowdrifts, while ptarmigans have a profusion of feathers on their feet for this purpose. I feel I should know this one but can't figure it out. 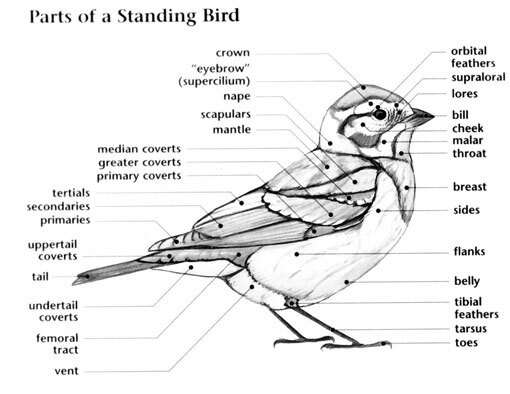 Also called the breast area, it is the frontal area on the body containing the breastplate and major flight muscles.